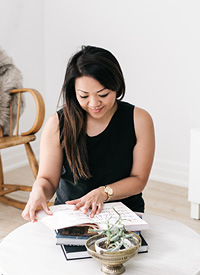 Cake Cake Cake — Love On Sunday Love On Sunday | Interior Styling in Toronto and the GTA. Okay. That Rihanna track is not really a birthday song and we all know she's not talking about cake. But, I figured my post title was rather appropriate since my diet has been filled with sugary treats and that song plays in my head every single time I bite into a delicious cupcake. So yup, it's ma birthday today! The past year has been amazing for me on all fronts and I feel so thankful for all the blessings that have come my way. I got engaged to the love of my life and I decided to invest more time in what I truly love to do - I honestly couldn't be happier! I decided to postpone today's Thrifted Thursday to share some photos from the wonderful dinner party I had this past Saturday. It was an evening with my favourite girlfriends and we had lots to celebrate - birthdays, graduation, engagement and a surprise baby announcement! I live in a tiny condo so having 8 ladies for a sit-down dinner called for some creative seating options. Unfortunately, my lens was wonky and it was a little hectic so I didn't get as many photos as I wanted. Plus, I wanted to relax, soak it all in, and enjoy the evening. Thanks to all the who came out that night and for the thoughtful presents. A big shout out to my girl Fleur, who spent the entire afternoon in the kitchen and to Kristen of Sugar Love Confections who provided the amazing desserts.